Rowntree lived in Surrey Street, Christ Church, Surrey (now in Southwark Council's area), and was an Engine Maker. It is not known how successful or otherwise his entry into lock making turned out to be. However the lock patent appears to present a fairly complex mechanism and may well have been expensive then to manufacture. Given the lack of information about him and the rarity of his locks it seems likely that Rowntree wasn't able to produce many of these locks. Nevertheless he tried something different even if, as seems likely the product wasn't able to sell in any practical quantity. 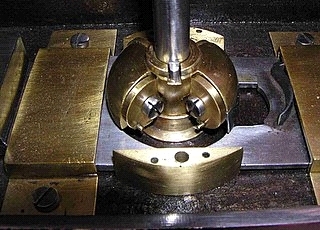 Alfred Hobbs in the Construction of Locks, 1853 comments: “Rowntree's is a very elaborate tumbler lock, and contrasts remarkably with the simplicity of Barron's lock. 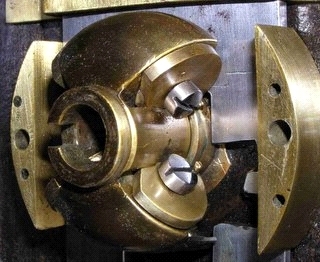 This lock is constructed with tumblers in combination with revolving discs or wheels”. He then went on to show the following drawings. Referring to the key (fig. 30) Hobbs says it is “cut into steps of different lengths (v v); each step operates on its respective lever (K) in a different degree from the others; the notch at 's' acts upon the tumbler, and the plain part 't' moves the bolt”. 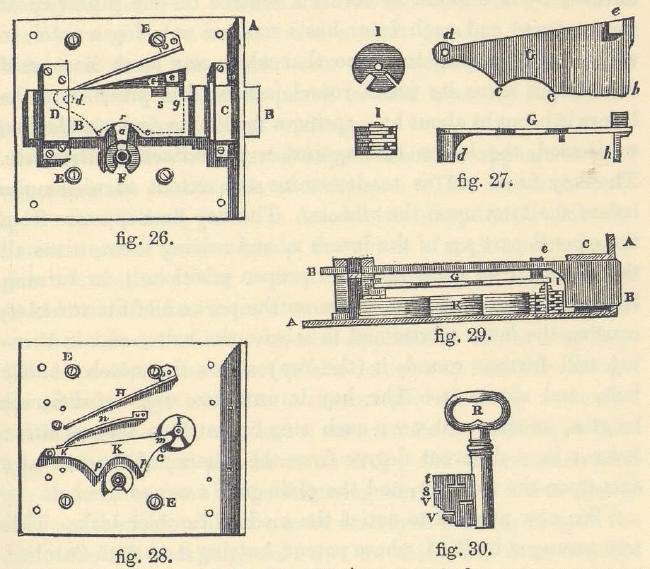 These figures appear to provide a better appreciation of how the lock operates in comparison with Rowntree's patent drawings, as enclosed with his Patent Specification relating to locks (Figures 1 to 9). His hand written notes, explaining how the variously lettered parts in the submitted drawings operate, are available in the patent section. 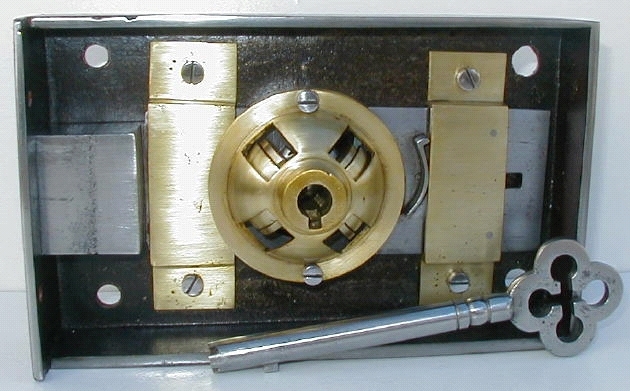 We are not aware of any locks which reflect this patent, however another Rowntree lock exists from which photographs are available, as shown below. The particular mode of operation is not known presently, but if/when further information becomes available about this highly unusual and rare lock, details will be added.